Has it been awhile since you’ve visited the dentist? Not after these pictures. 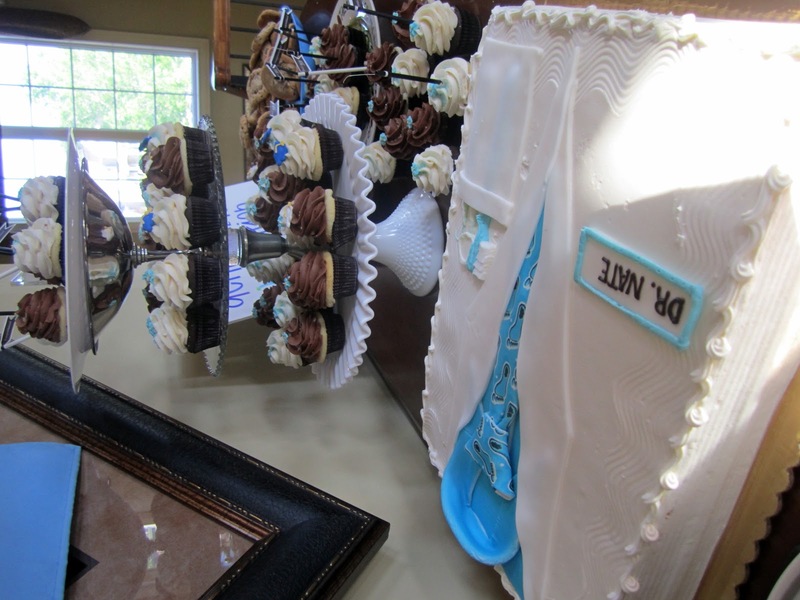 Check out the dental school graduation party I did this past weekend, and you will see enough teeth and toothbrushes to claim a visit to the dentist this year! Mr. Fo’s cousin, Nathanael, had a career way before he had a future with teeth. He was what you call a male model. Those closest to him called him “Fabio.” Fabio posed with beach balls at a young age to model swimwear and other summer gear for the local catalogs. He was somewhat of a celebrity, if you will, and when I came into the family 10 years ago (10!!! ), I had no clue that young Fabio would give up his head shots for a set of dental tools. But alas, sometimes child models CAN become dentists, and when they do, a tooth-themed party MUST occur. It’s truly a fairy-tale, isn’t it? Aunt Caran, Nathanael’s mom, approached me about planning her son’s graduation party, and we had SO much fun! We even got tattoos at the end of it all to celebrate, but more on that later. After months of planning, the party ended up being a whimsical and fun tooth-themed extravaganza….let’s take a look! Signs pointed to “Dr. Nate’s office” so his patients wouldn’t get lost. The final stop was to grab the “goody bags” on the way out. The bags had your typical toothbrush and floss, and also included sugar free lollipops. Unlike a visit to the dentist’s office, there were lots of fun touches throughout the party. The flower arrangements had toothbrush accents. See those rubber duckies? They were dental duckies found at Oriental Trading, complete with toothbrushes and lab coats…they have duckies in every profession you can imagine! The sweet tooth demineralization station had cupcakes and cake galore. You aren’t going to believe this, but even the Tooth Fairy showed up! (If you’re guessing this looks an awful lot like my niece Brookie, it’s just a total coincidence.) Check out her special shirt! The tooth fairy is a very healthy eater – look at all that avocado! Congratulations to Dr. Nathanael Shaw (aka Fabio)…I guess dreams can come true for a former beach ball model. i love the cake/ labcoat idea. i’ve never seen anything like that before. something tells me i would visit the dentist much more often if my doc looked like dr. nate. Hilarious! Love all the signs. And of course, the tooth fairy! The dental motif is awesome! Ha ha, it’s a nice theme and, from the looks of it, the tooth fairy is having a ton of fun. Well, big congratulations to the graduating dentists! Good luck to them! I love the table settings.. Awesome set up. Would really like to know where you bought those x and o games on the tables. I’m doing a grad party for a dental assistant and I am looking for ideas. The above web page is not available. Is this the site you purchased all the accessories? Where did you find the tattoos? This venue had everything we needed for our wedding. The cocktail hour was delicious and food was of high quality! I loved everything; it was just as good as my mom’s. Dental School Graduation is an awesome time to celebrate accomplishments and share memories. It’s also time filled with critical life choices along with a calendar filled with commitments. Oh really, it was a amazing Dental School Graduation Party. Hope that it is more effective to student for make more confidence and it will be good direction for the coming graduation students.